A refuge from the pressures of modern life that provides all the amenities of home and the rustic charm of an invigorating outdoor experience under legendary blue skies and the abundant sunshine that has drawn artists for centuries. The two-hundred acre setting embraces a breadth of possibilities for accommodating smaller family gatherings to larger community-building corporate retreats. Bishop’s Ridge: the mountain setting caters to all sizes of marriage parties, family reunions, corporate retreats, and provides an affordable option for vacation rentals. This mountain refuge may be rented in part or in whole. Three A-frame cabins array around a central bathhouse, and beyond the Lodge after a longer stroll, three more A-frame cabins share another bathhouse. The separate groupings provide the opportunity for gender separation with counselor areas in each cabin. Bunk beds in the best of the summer tradition sleep up to 84...14 people per cabin... and one cabin in each grouping provides wheel-chair accessibility. A Pool that can service up to 75 swimmingly. An Archery Range with bows, arrows and targets. Trails that course through the varied terrain. Playing Field: Just right for soccer, volleyball, running games. Cabins: Two groups of 3 cabins share a bathhouse (4 showers/4 toilets/5 sinks), 2 Cabins (one per section) also have a toilet and single shower, 2 Cabins (one per section) are wheelchair accessible with a toilet and single shower. Each cabin is split into a large front section with 5 bunk beds and a small back area that has 2 bunk beds. Please note, whether renting one cabin, or all six cabins, we only rent the cabins to one group or organization at a time, to ensure a quality experience and the safety of our guests. A Lodge: That has meeting spaces and a full professional kitchen, please reference VRBO#690172. The Retreat House: which can accommodate families, small retreat groups or leadership teams, please reference VRBO#690167. This property was gifted to the Episcopal Diocese with the intention of running youth-related camps. Cabins Each group of 3 cabins has a shared bathhouse (4 showers/4 toilets/5 sinks), 2 Cabins (one per section) also have a single shower, 2 Cabins (one per section) are wheelchair accessible with single shower. A/C in main lodge only. Main Lodge Fully equipped kitchen that groups may use or catering can be arranged. Main Lodge Large dining/activity area with tables and chairs to accommodate 100 people. A large fireplace services both the interior of the lodge and the patio. What an awesome property. The hosts are kind, understanding and very very conscientious about their guests. Thank you so much for having our group. Had a wonderful time with extended family. Great place for that! All our younger generation slept out here. All had a great time! Very tidy and affordable glamping with access to beautiful wilderness just out the door! 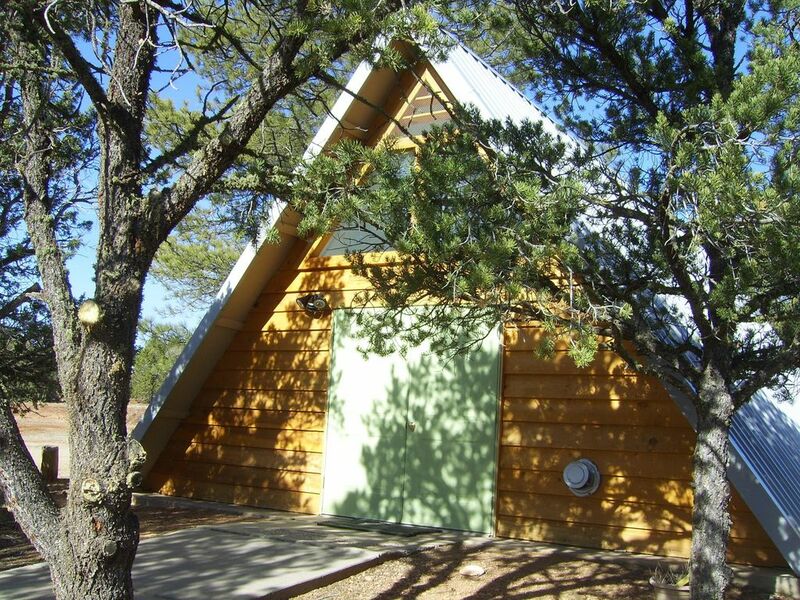 Our 6 A-frame cabins are bunk bed houses that can accommodate 14-18 guests. Our cabins are seasonal use only from March to October and not available during June and July. $75.00/night per cabin.